This quirky little WWII escape film about a loony private getting the chance to be a General had the unfortunate duty to follow Paul Newman's massively successful Cool Hand Luke. 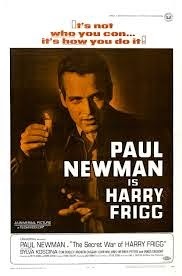 It was also Paul Newman's second outing with director Jack Smight after 1966's Harper. So of course with those two things going against this film it flopped. No, those aren't the only reasons, but they contributed to this film's rather mediocre standing in Paul Newman's mostly great catalog. My dad loves this movie, though. I got him it for Christmas on DVD and we even did a Paul Newman movie exchange shortly afterward. I let him watch my copy of Harper and he lent me his copy of The Secret War of Harry Frigg. The Great Escape this film is most certainly not. It's not Patton or M*A*S*H, either. You'll probably never see this list on a list of great war movies or comedies about WWII or any other war. When it was released in '68 Roger Ebert wasted no time in skewering this movie and these days the movie hasn't fared so well in the less traveled wastelands of IMDB and Rotten Tomatoes. But I don't care about any of that. I liked this movie. Yeah, I could compare it to a lot of great films and destroy this movie. Hell, I could probably destroy this movie without doing any of that. Yet I won't because I admit that the idea of going from a slacking nobody to someone of importance and power without trying is a pipe dream of mine. Gee, if only I didn't have to work. If only someone could hand me a huge promotion without me having to actually earn it. Wouldn't that just save me a huge chunk of time and effort? That is essentially what this movie tries to sell us and it does so without caring a thing for real life and stuff like that. Not only does Harry Frigg get this huge promotion from Buck Private to Major General and a chance to be a total hero, but he also gets the chance to wow a Countessa that seems to live right next to a rather lavish Italian prison where five generals are be held. What are the odds? Harry Frigg has been sent to this prison for the sole duty of freeing these five generals who can't seem to agree on a way to escape. Why Harry? Well, Harry has been in the stockade plenty of times and each time he managed to escape. The brass in charge believe that is enough to make Harry the man for the job. Who needs Steve McQueen and James Garner? This film is a complete fantasy and that is mostly why I like it. It makes about as much sense as Lucy, but it is good for a few laughs. Plus any movie that makes fun of authority figures is okay by me. I probably have problems with authority figures. Good thing I am one. Andrew Duggan, Charles Gray, Tom Bosley, John Williams, and Jacques Roux portray the five captured generals and James Gregory is the general that promotes Paul Newman to general. Generally speaking, there are a lot of generals in this film. My inner M*A*S*H fan was delighted see James Gregory and Andrew Duggan in this film because they both played generals in the tv show. Gotta admit that was a cool fanboy moment. I liked the supporting cast of this movie because they were familiar faces. Sylva Koscina was also pretty to look at even though her presence in the film was completely ridiculous and her delivery was just kind of there like her character. It all goes back to Paul Newman, though. He carries this film although this is far from his greatest performance. For what it is The Secret War of Harry Frigg isn't a bad film. It can be quite enjoyable. Just don't expect a masterpiece.